+ McCoy Tyner, Steve Davis u.a. 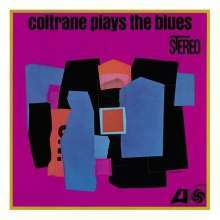 While Coltrane first gained attention for his revolutionary ‘sheets of sound’ technique, it was the deep spirituality of his music that really made his solo records such classics. The albums this giant of music recorded for Atlantic in 1959 and 1960 really represent the heart of his legacy. Coltrane's sessions for Atlantic in late October 1960 were prolific, yielding the material for My Favorite Things, Coltrane Plays the Blues, and Coltrane's Sound.